NO CDD..LOW HOA DUES - Located in the desirable “Club House Estates” Of Summerfield this UPDATED home is a must see!! Sitting on an OVERSIZED FENCED CORNER LOT this home features 4 bedrooms 3 baths a 3-car garage & more than 2500+ heated sq. ft along w/a HUGE ENCLOSED PORCH & a 3-way split floor plan! 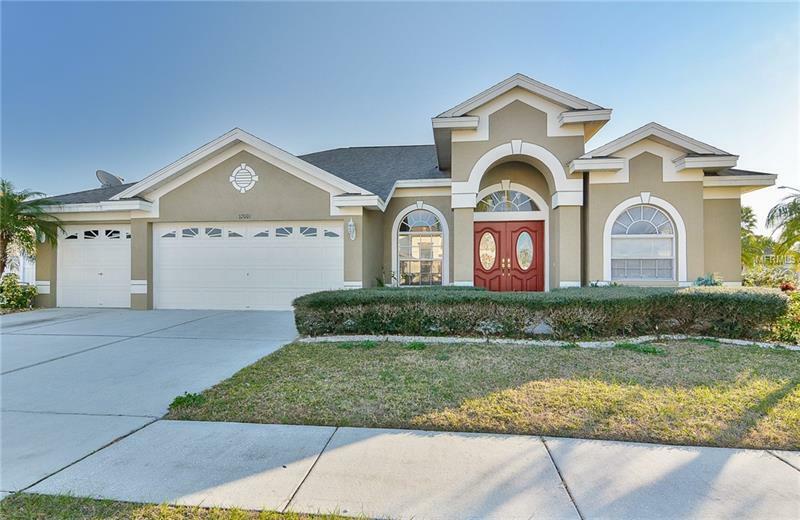 Lush landscaping leads you to the beautiful double front doors & into the foyer where you will immediately notice the entryway columns volume ceilings archways crown molding diagonal set tile and decorative wood trim accents throughout which make this home very unique! The chef of the home is going to love this kitchen featuring all stainless appliances granite countertops pantry & a U-SHAPED island w/a breakfast bar that overlooks the breakfast nook and family room. The large MASTER SUITE is located off the living/dining room has a large CUSTOM CALIFORNIA CLOSET with TONS OF STORAGE & SHELVING. The oversized vanity & dual sinks pull together the master bath w/a soaking tub & separate shower. Imagine what you could do with the enclosed & glassed 376 sq ft porch (not included in the heated sq ft). This community has good schools a golf course swimming pool sports field basketball courts fitness center and much more. Lower HOA close to I75 restaurants shopping center McDill Air force Base easy access to the beaches boating Downtown Tampa museums Busch Gardens The Zoo 90 minutes to Disney and not far from the Tampa Airport. Enjoy the Florida Lifestyle! Copyright © 2019 Mid Florida MLS. All rights reserved. The data relating to real estate for sale on this web site comes in part from the Internet Data Exchange Program of Mid Florida MLS. Information provided is for consumer's personal, non-commercial use and may not be used for any purpose other than to identify prospective properties consumers may be interested in purchasing. Assist-2-Sell The Eshack Team participates in the MFRMLS Internet Data Exchange (IDX) program, allowing display of other MFRMLS broker's listings on this site. However may not include all listings currently available. Information is deemed reliable but not guaranteed. Information last updated at 2019-04-25 03:39:00.